It’s the largest church of Ireland with a tower of 43 metres. Back in the days it used to be a simple wooden house. 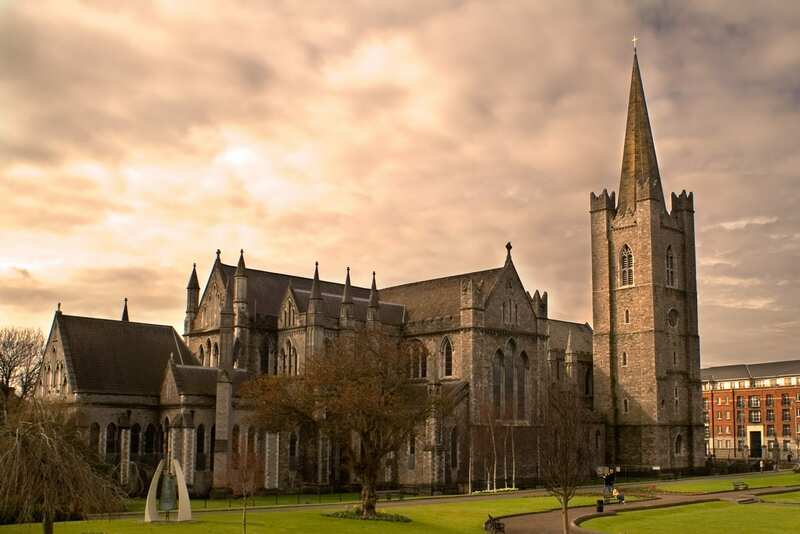 The rising of a cathedral dates back to 1191 until 1270 being built in favour of Saint Patrick. He used the space to baptize converts to Christians. The area is much taken care of and is in our opinion worth a visit, even if you’re not religious. The architecture is simply stunning. Today the place is used for national ceremonies and is the most visited tourist attraction of Dublin. This incredible building is in Dublin for many years already and can be considered the most beautiful and impressing one. It has been built from 1781 for 10 years. In the civil war of 1921 the Custom House has been destroyed but rebuilt after. The business of the customs and the excise for Ireland has all been dealt with in the Custom house. Other departments such as the Stamp office and the Stationery office also found their space over there. Number three on our list is this stunning building located on O’Connell street. It dates back to 1818 and is the headquarters of the Irish Post. The front extends 67.1 metres and on top of the building three roman gods and goddesses can be spotted: Mercury, Fidelity and Hibernia with her harp which is a great symbol for Dublin and its Guinness for instance. The building is a symbol of Irish nationalism, even after having been destroyed in 1916 and nowadays it still remains a post office with many services such as stamps, post boxes, phones and much more. This garden, situated in Dublin 8 and built in 1939, is one the most famous ones in Europe and is dedicated to the almost 500,000 warriors who lost their lives during the first World War. The names of the soldiers are written in stone, architectural buildings and flowers are decorating the gardens and make it easy for people to stroll around for 45 minutes and sink away in their thoughts and memories. We think it’s wonderful, especially during Spring and Summer time. One of the most questioned monuments in Dublin but probably that’s what we like about it. It’s been built in 2003 for a cost of €4 Million and is 120 metres high. Tons of stainless steel are holding the pin together and are replacing Nelson’s Pillar, filling this spot of O’Connell street before. After having been bombed it took Dublin 38 years to replace the gap of the centre of the city, as it was seen by many people. Today, the meaning of the Spire is the representation of the millennials. It represents the modern and innovative side of Dublin and is opposed to the other historical architectural monuments at O’Connell street. This cable-stayed bridge is one of many famous bridges in Dublin but it’s definitely the newest one. It’s been designed by a Spanish architect with the intention to design a spinning harp on a coin. 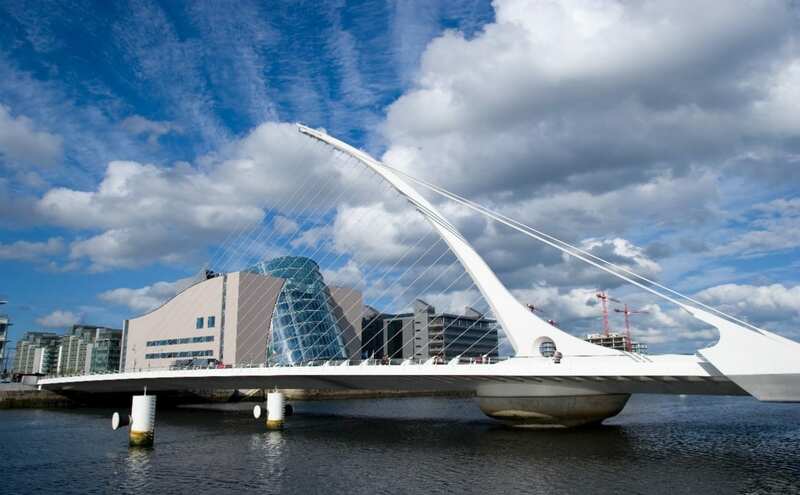 Samuel Beckett was a famous Irish poet and the bridge has been dedicated to him. It’s been open to pedestrians and transport for the first time in December 2009 and was built at a cost of €60 Million. It’s an incredible asset to the landscape of Dublin and can be found in many pictures all over the world. It’s the closest bridge to the docklands and leaves more space for traffic as well. There are many more architectural sights to talk about in Dublin but why don’t you come here and find out yourself?